Charanka/Gandhinagar: The former head of Charanka village in Gujarat no longer seems to mind the harsh sun. His was a nondescript village until it was identified as a solar hot spot—a region with high “direct normal irradiance levels", according to a 2010 feasibility report prepared by the Clinton Climate Initiative. Charanka has seen a rush of activity since then. Raghavdan Gadhavi, the 47-year-old former head of the village, says he now sees the advantages of the blazing sun. A glance from a nearby watchtower overlooking the park reveals that what was once a desert is now a showcase for the Narendra Modi government’s ambitious Gujarat solar policy, laid down in 2009 ahead of the Centre’s national solar mission that aims to install 1,000MW capacity of solar power-generating capacity in the first phase. India wants to be able to generate 20,000MW, or 20 gigawatts (GW), of solar power by 2020. And Gujarat aims to be the biggest contributor. The state has commissioned 600MW of solar power projects, including those in the solar park. All that activity and focus has brought in the expected benefits to Charanka, a modest village of 700-800 people. Land prices in the area—a shallow wetland that gets submerged during the rainy season and turns dry at other times—have more than doubled in the past two years. More jobs have become available and Gadhavi expects even more will be created when solar park ancillary units are set up. But all the activity is not without its headaches: the government wants to acquire more real estate. “We have led a tough life all these years and it is indeed good news that a project of this scale has come up in our village. (But) the government wants to expand the solar park and it wants our lands," says Gadhavi. “Some of the villagers have sold and gone away. We, who are left, have firmly refused to part with our lands." The existing portion of the park is built mainly on the government wasteland of about 2,700 acres. The state has planned a total area of 5,000 acres for the solar park, envisaged to eventually host a total capacity of 500MW. “Soon after announcing the state policy, we were a little worried, as the central policy offered higher tariff as compared with ours. We chalked out a strategy and worked on better and faster implementation of the projects and provided infrastructure facilities to developers," said D.J. Pandian, principal secretary in Gujarat’s energy and petrochemicals department. The Gujarat government has set a tariff of ₹ 15 per kilowatt hour (kWh) for the first 12 years and ₹ 5 a unit from then to the 25th year for solar photovoltaic projects commissioned before February—less than the Jawaharlal Nehru National Solar Mission’s offer of ₹ 17 per unit for 25 years. But Gujarat’s strategy of fast implementation and infrastructure provisions was enough to draw in more than 5,000 proposals from developers for solar projects in the state, and today solar installations in all other parts of the country put together add up to less than one-third of those in Gujarat. The higher initial tariff, an incentive to attract developers, is estimated to set Gujarat back by ₹ 3,600 crore in terms of subsidies, but that may be a small cost to pay for a cleaner environment and lower dependence on scarce fossils. Also, India’s demand for electricity is surging and the Union government looks to solar power as a key contributor. Commissioning the projects last week, Gujarat chief minister Modi said the cost of generating solar power, which has fallen to ₹ 8.5 per kWh from ₹ 15 a unit about four years ago, will eventually drop to the level of gas- or coal-based power generation, which is ₹ 2.75-3 per unit now. Gujarat’s overall integrated renewable energy potential is estimated at 748.77GW, of which the potential for concentrated solar power is 345.71GW, and from solar photovoltaic panels, 21.36GW, according to a study by non-profit, The Energy and Resources Institute, that was unveiled on Thursday at a seminar on solar energy in state capital Gandhinagar. Solar installations in Gujarat so far have attracted ₹ 9,000 crore in investments. The plants are expected to generate about three million units of clean energy every day, enough to light up one million households. Gujarat Power Corp. Ltd, the nodal agency for implementing the solar park, has invested close to ₹ 300 crore to develop the infrastructure. The Asian Development Bank has loaned ₹ 500 crore to Gujarat Energy Transmission Corp. Ltd, which has invested ₹ 650 crore in the park for a smart evacuation and transmission network. The Clinton Climate Initiative, founded by former US president Bill Clinton, had signed an agreement in 2009 with the Gujarat government to set up the world’s largest solar park in the state, one that would have produced 3,000MW of power. The ambition had to be scaled down as such a huge project was not economically viable. The government took over the implementation. In 2010, 85 project developers signed agreements with state power utility Gujarat Urja Vikas Nigam Ltd to supply 968MW of solar-generated power. But heavy monsoon rains last year, insufficient finances, and land acquisition problems took a toll on many of their projects. Early this year, about 30 of those developers approached the state electricity regulator to seek an extension to the deadline for commissioning the projects. The plea was dismissed. “Some of the developers who were really serious went ahead and completed their projects, having paid some fine for the delay. There were a few developers whose projects were ready, but they could not be commissioned, as the power evacuation centres could not be completed by the state department concerned. The government has considered their case," a state government official said on condition of anonymity. “But projects of about 250-300MW may not see the light of the day, as they are yet to get some basic government approvals." The state’s ambition to be the country’s solar equipment manufacturing hub is also threatened. Manufacturing photovoltaic panels and other parts locally will bring down the cost of generating solar power, according to Saurabh Patel, Gujarat’s energy and petrochemicals minister. But inexpensive Chinese equipment has already captured the market, hurting the prospects for Indian manufacturers. “Chinese companies have been dumping solar panels in India as well as the global market. Against a global demand of 20GW, Chinese companies have built 50GW. Solar equipment manufacturers in the US and Europe and are shutting shop," said Ratul Puri, executive director of Moser Baer India Ltd.
Moser Baer makes solar equipment and is a developer of two solar plants in Gujarat with a total capacity of 45MW. But exports have fallen from 70% to 50% of the total sales for the company in the last one year, mainly due to Chinese supplies, Puri said on the sidelines of the Gandhinagar seminar. This shortfall was balanced by growing domestic demand, he said. To overcome the challenges, the company uses a mix of silicon and thin film technology to increase its plant load factor—a measure of the average capacity utilization of a power plant—by 30%, Puri said. A solar photovoltaic plant of 1MW capacity is likely to generate 1.72 million kWh per year at 19% plant load factor as compared with 6.5 million kWh at 80% plant load factor for coal- or gas-based plants. “We lost the semiconductor race, first to Japan and then to Malaysia and China. We must not lose this one," said Puri. 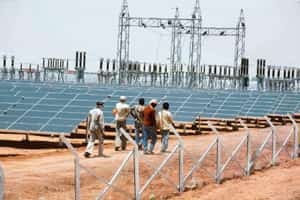 A person setting up a solar power project in Gujarat, speaking on condition of anonymity, said it would take a developer six-seven years to make profits on such projects. But developers can avail a depreciation benefit of up to 80% on capital investment by floating a subsidiary firm, and some companies that are not necessarily serious about the industry enter the business to take advantage of this, he said. On Tuesday, Gujarat launched a pilot project to generate 1MW of solar power from panels installed along a 1km stretch of the Narmada canal near Chandrasan village, around 75km from Ahmedabad. The engineering, procurement and construction contract for the project had been awarded to a subsidiary of SunEdison of the US for about ₹ 17.5 crore. Installing the solar panels over the canal will help prelude the need to acquire land, while curbing evaporation of around 9 million litres of water in a year. Power generated from the project will be supplied to villages alongside the canal, reducing transmission losses. The state has also implemented a rooftop solar power plant policy to enable people to produce their own electricity and earn money by selling surplus power to the grid, at about ₹ 3 a unit. A state official, who didn’t want to be identified, said the project will save space, but the grid will have to be redesigned, as there will be a two-way flow of electricity that will have to be recorded. Modi wants the state to take the initiative to form a group of solar-producing nations on the lines of the Organization of Petroleum Exporting Countries. Former Union power minister Suresh Prabhu said he is working on the idea and has proposed a club of representatives from various countries. These countries should have access to sunlight for at least 300 days in a year. “We will work collectively on areas such as technology-sharing in solar component manufacturing, and this will help us in further reducing the cost," said Prabhu, a member of Parliament and chairman of the Council on Energy, Environment and Water, a non-profit organization. Investment growth in the renewable energy sector in India was among the highest in the world in 2011, said Ashish Sethia, head of India research for Bloomberg New Energy Finance, which keeps a track on clean energy projects worldwide. “Investments rose 52% to $10.3 billion (Rs 54,384 crore today), with solar contributing $4.2 billion, of which $2.8 billion was invested in Gujarat," he said. “India entered solar generation at the right time, when the cost of generation had gone down. Gujarat had done the ground work, created an ecosystem and had the necessary policy framework in place by this time." In terms of numbers, he said, India’s contribution to global solar installations is not as significant as by countries such as Germany or Italy that are adding capacities in gigawatts every year instead of megawatts. “But this year, we will see India crossing 1GW of installed solar capacity and Gujarat has laid the foundation for this."